I was recently in the UK, and took my daughter Scarlett to Paris for the day! 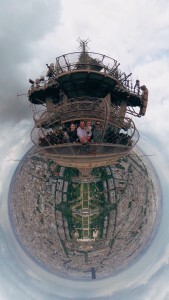 While there, she climbed all 669 steps by herself (watch the video) to the top of the Eiffel Tower, where I took this photo! Click and look around, anywhere! Here is the cropped version that I posted on reddit before flying home. When I landed in America the photo had gone mega viral!